How do I communicate with the renter? By allowing you to view & send messages on our secure platform, Sailo makes communication with the renter simple. When logged in, you will see a new notification in the top right corner. Simply click the notification or go straight to your inbox to view the message. From there, you can reply to the message and make all arrangements with both the renter, as well as the captain. You can also choose to receive email and/or SMS notifications whenever someone reaches out to you. How do I activate my SMS (text) notifications? 1. Add and/or verify your phone number: go to My Profile -> General -> introduce and/or check if your phone number is correct -> click Save - > click Send Verification Code. Enter the code you receive via SMS and click Save. 2. Enable SMS notifications: go to My Profile -> Settings -> Notifications - > check the box for SMS notifications - > Save. -> Type HELP to see all the commands you can use. For any questions, please reach out to support@sailo.com or by phone at (646) 780-9275 . How do I approve or decline booking requests? When you receive a booking request, a new notification will pop up in the top right corner of your home page. Simply click the notification or go Dashboard or Inbox to view the message and/or request for booking. 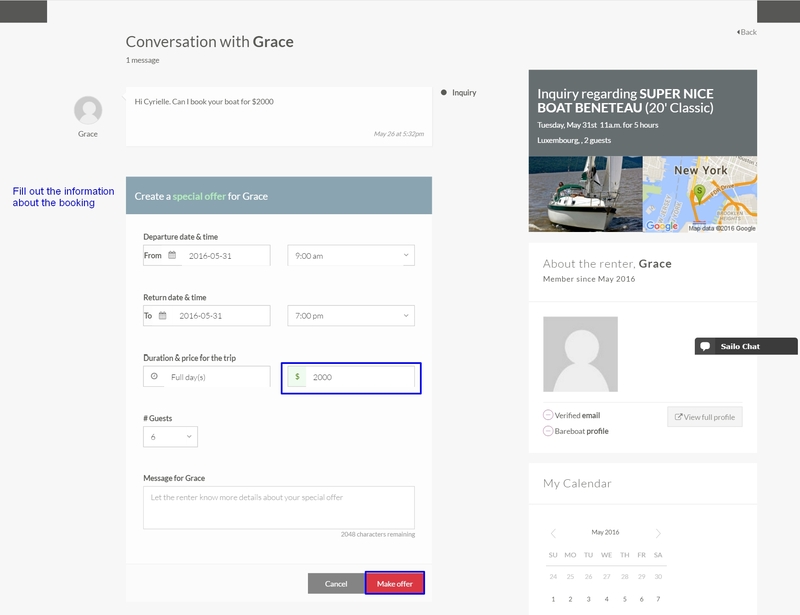 Once you receive a booking request, you will be able to Accept it (if you are comfortable with the renter and all the information on his/her profile) or Decline it (if you are not comfortable with the renter trying to book your boat or if your boat is unavailable during the requested dates). How do I know if the rental is confirmed? Once a booking has been accepted, you will receive an email notification confirming the approved booking. You will be able to see the booking in My Trips section with all relevant trip details including renter, boat and captain information, booking request date, departure/return location, price breakdown and pickup instructions from the boat owner (if any). We advise that you respond to any messages and request for booking right away to facilitate a smooth and quick process. If you don't respond to the booking request within 24 hours, the request for booking will expire. Allowing your booking requests to expire will over time make your listing appear lower in search results, so make sure to follow-up on all requests promptly. Also, the faster you respond, the better your overall response rate will be on your profile. As an owner, you may cancel a booking at any time for justified reasons including, but not limited to, poor weather or if you feel uncomfortable with renter’s profile and/or boating qualifications. You can cancel a booking by going to My Trips, selecting the booking you are trying to cancel and clicking on Cancel. Since owner cancellations require additional customer support, as well as funds for securing last-minute accommodations, for frequent cancellations your listing may be lowered in our search results and/or your account may be temporarily suspended with the listing being removed from the site. Please refer to the Sailo Cancellation Policy for more information. Can I create a special offer for a potential renter? Creating a special offer for a potential renter is simple and private. 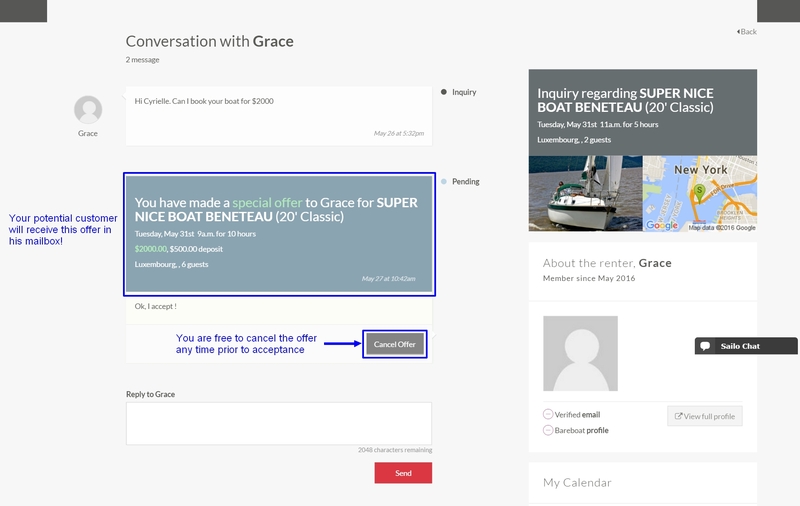 To create a special offer, visit your mailbox, select the message thread you have with the potential renter, and click on “Create special offer”. Within a few seconds you have privately made a special offer that can be accepted and confirmed immediately. Once you are logged in, click on your username at the top, right-hand corner of any sailo.com page. 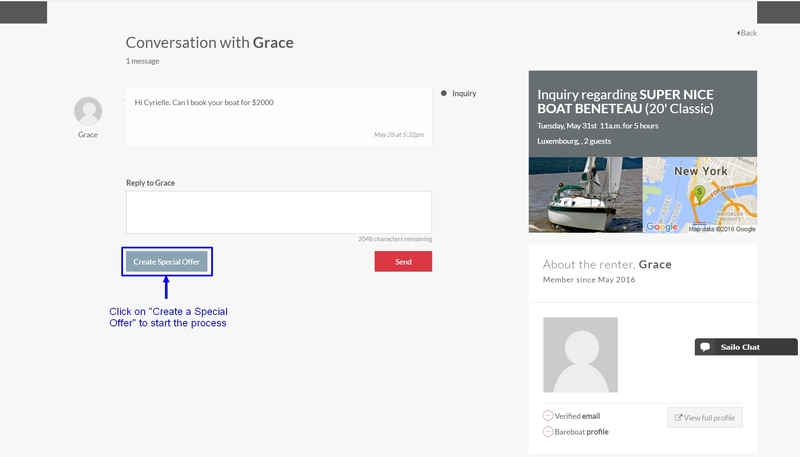 Then click on “Mailbox” to access all of your conversations and private messages with renters. View the various messages in your mailbox, and select the person to whom you’d like to make the offer. Click on “Create Special Offer” to start the process. Simply follow the instructions and fill in the information about the booking, such as date and departure and return times, duration of the trip, number of guests, and of course the special price you would like to offer. To confirm and send the offer to the renter, click on “Make Offer”. The renter will then receive the special offer, which he or she can accept or decline. The offer will then be valid for 5 days before expiring. You can cancel the offer any time prior to the renter’s acceptance, simply by clicking on “Cancel Offer”. Once your offer is accepted, the renter’s credit card is automatically charged and the booking is confirmed!